In a small northern Dutch town lies a sprawling flower garden that can only be described as Disneyland for horticulturalists. The Keukenhof garden is the ultimate Dutch tourist attraction, filled with millions of tulips – the country’s poster flower – and up to 800,000 visitors in the two months a year when the flowers bloom and the garden is open. Although it admittedly sounds like the definition of kitsch, I felt I couldn’t spend a year studying in the Netherlands and not visit this mecca of Dutch-ness. 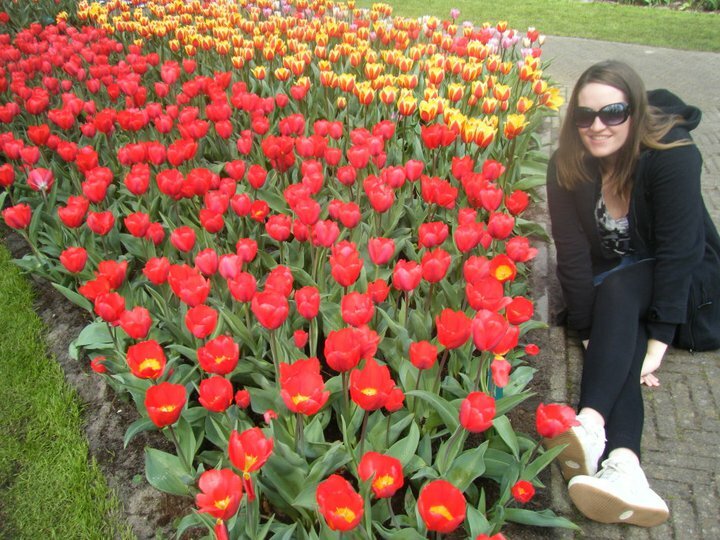 Lauren at Keukenhof Flower Garden. Before I go any further though, in the interest of full disclosure, I should note the tulip was actually first cultivated in Turkey. It wasn’t until the mid-1590s that the flower bulbs were imported to the Netherlands and the tulip rapidly gained status as a luxury item and national symbol. In fact it was so popular that demand for the rarer varieties created the world’s first economic bubble – and burst. At the peak of tulipmania, in 1637, some single tulip bulbs sold for more than 10 times the annual income of a skilled craftsman. However, reality soon set in and demand (and values plummeted). These days the Dutch tulip industry is worth about $40 billion and 19 million flowers a day pass through the enormous auction market at Aalsamer. The Keukenhof flower garden, near Lisse, boasts an astonishing 4.5 million tulips in 100 varieties, lovingly landscaped and hand-planted amongst 15km of footpaths over 32ha of land. Its website claims it is the “largest bulb flower park in the world” and the “most photographed place in the world” – possibly true given I left with a flat camera battery and full memory card. A vibrant rainbow of tulips. The garden is cleverly landscaped to make the most of the varying colours, shapes, textures and heights of the flowers on show (which also include daffodils and orchids). Combinations of ground coverings, like daisies, up to tulips reaching waist-height create a 3D effect. Colours are used in stark contrast (think slashes of red, blue and yellow together) or complementary shades (such as waves of dark purple through magenta to light pink). 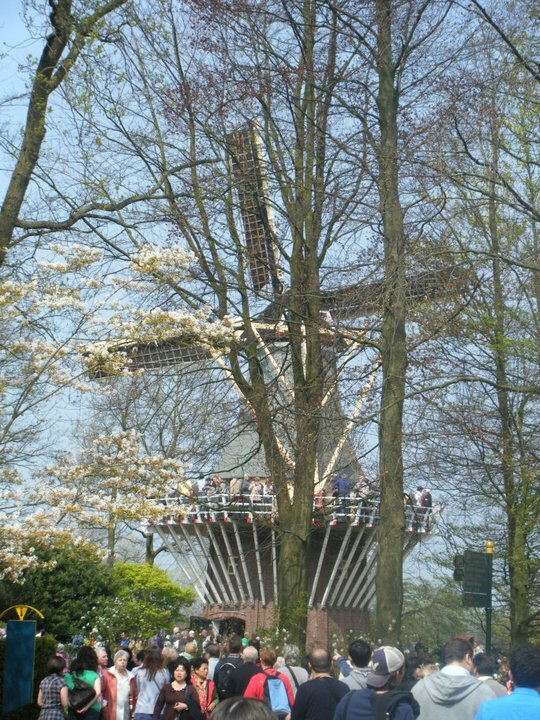 The flowers are set beside fountains, on the edge of miniature lakes, in children’s playgrounds and at the base of replica windmills. 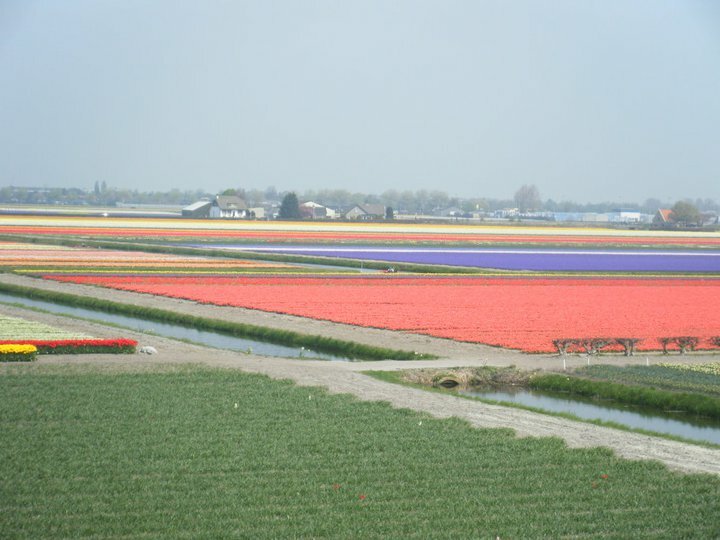 The area surrounding the park is dominated by sprawling tulip farms which look just like the aerial shots on tourist postcards: rows and rows of rainbow flower heads forming carpets of colour blanketing the countryside. The only downside is the cringe factor of watching hundreds of tourists ignore the “please stay off the grass” signs and tromp into the flower displays for the perfect ‘photo op’. Grown women forcing their children out into the middle of expensive, hand-planted flower arrangements for painfully posed photos. When we’d finally covered the entire park (stopping for an obligatory picnic), and frolicked in the tulip farms outside, it had been a solid six hours of fawning over flowers. I never thought I could spend that long appreciating petals but Keukenhof proved to be one stereotypical tourist attraction which lived up to its hype. Stunning and oh so very Holland. · In the Ottoman Empire “Tulip Era” (1703 – 1730): Romantic names from the Turkish florist-in-chief of the Sultan’s court including “Those that burn the heart”, “Matchless Pearl”, “Increaser of Joy”, “Diamond Envy” and “Light of the Mind”. · In the time of Tulipmania (peaked in 1630s): The most famous bulbs “Viceroy” and “Semper Augustus” or the group of tulips featuring red, brown or purple on a yellow background labeled “Bizarden”. · In the Keukenhof garden today: Modern names such as “Night Club”, “Teletubbie”, “Candy Kisses”, “Talent” and “Eruptie”. I can’t believe the ignorance of some, who disobey the signs not to go on grass, then teach their kids the same. I’m afraid I would want to have said something to them about honouring the wishes of the garden’s caretakers. If everyone had that attitude, we would never have the pleasures of seeing such vibrant beauty.